It is bound to come up in the days ahead as the San Jose Sharks enter the Stanley Cup playoffs for the 11th time in 12 seasons. How many more seasons can the San Jose Sharks seriously compete for a Stanley Cup? How long does their ‘window of opportunity’ remain open? The Sharks feature five players 35 or older heading into the postseason. Four are major players, combining for 30% of the salary cap. Those four are Paul Martin, Joel Ward, Joe Thornton and Patrick Marleau. All four are signed for at least another season. The fifth member of the group is Dainius Zubrus, a useful role player. The ‘window closing’ scenario has been around a while. I first recall hearing the ‘window’ discussion in the 2011-12 season. Top forwards Marleau and Thornton were approaching their mid-30’s, while top defenseman Dan Boyle was already 35. People were suggesting the window was beginning to close. Remember those days? Douglas Murray was patrolling the San Jose blue line and Ryane Clowe was beating people up. In the last few years, Boyle departed and Marleau degraded. Both Clowe and Murray left San Jose and have since retired. Still, the window remains open. The Sharks window is not nuanced or hard-to-define. It is simple. It is Joe Thornton. Thornton, as he has been every season since he arrived in 2005, is the best player on the team. A sure-fire Hall-of-Famer, he has been among the best players in hockey. He still is. Thornton has gotten only modest recognition during the last decade (measured by All-Star games, Team Canada selections, Hart or Selke nominations, etc). Somehow, he has managed to skate under the radar while producing 866 points in 834 games for San Jose. For San Jose to compete, they need the big man in the pivot to match-up against the other elite California centers, the Kings Anze Kopitar and the Ducks Ryan Getzlaf. While the three are not clones, they have far more similarities than differences. They are big, creative on offense, and tremendous passers with great vision. It is insanely difficult to get the puck away from them. They are smart and opportunistic on defense. They are hard to play against in all three zones. Over the past 3 seasons: Kopitar has 207 points and is a plus-67; Getzlaf has 209 points and is a plus-57; Thornton has 220 points and is a plus-41. For this season and the foreseeable future, the Sharks will need to get past either LA or Anaheim to get out of the Pacific Division in the playoffs. Some years, they might need to beat both. Thornton is 36. Getzlaf is six years younger, Kopitar eight. As long as Thornton can hold his own with the other two, so can San Jose. Thornton has been a workhorse, so it has been rare for the Sharks to get a peak at what life without him might look like. Since joining the Sharks, Thornton has never had a season where he has missed more than four games. In the midst of the 2014-15 season, a shoulder injury took Thornton out for four games. In his absence, the Sharks went 2-2; both losses were by scores of 7-2, the team’s worst defeats of the season. Thornton’s play diminished after returning from the injury. The open question was simple enough: was Thornton beginning to decline or was he playing injured? This season, he delivered a point per game, finished a plus-25 and has a compelling case for the Hart Trophy as the league’s most valuable player. We can banish the ‘decline’ argument. Last season, the Sharks franchise got a 44-game look at what life is like with Thornton either out of the line-up or in the line-up, but not very healthy. It wasn’t pretty. The team was 20-13-5 before Thornton got hurt, 20-20-4 the rest of the way. 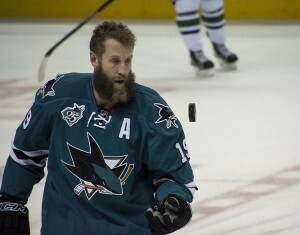 Thornton has expressed a desire to play until he’s 40 and to play his whole career in San Jose. If anyone wondered if the grind was getting to him, check out his reaction to the crowd applause (in game 81) when the big screen in San Jose showed he moved in 28th place all-time among NHL scorers. This is a guy doing what he loves. Players decline in different ways. Jaromir Jagr and Teemu Selanne have proven a player can be effective well past 40. But Thornton needs to be more than effective for San Jose to keep a window open. He needs to be elite, or at least close to it. Fortunately, the thought of Thornton slowing down isn’t particularly daunting. He’s been called ‘Slow Joe’ because of his tendency to slow the game down. Thornton isn’t slow per se, but speed is not the asset he uses to create opportunities. Slowing the game down suits his style of play. If Thornton loses a step, its possible no one would notice. Power, vision, balance and puck control are Thornton’s game. These things are likely to endure a bit longer than speed or quickness. How Thornton declines will determine how long the Sharks window stays open. If Thornton is no longer capable of 18 minutes a night, but can be 90% of who he has been for 15 minutes a night, he’s still a problem for other teams and the Sharks window can stay open. As of now, there is no one on the Sharks capable of filling the big guy’s skates. That isn’t likely to change. There are times in sports where greatness replaced greatness. Magic Johnson followed Kareem Abdul-Jabbar for the Los Angeles Lakers basketball team. Steve Young followed Joe Montana for the San Francisco 49ers football team. And sure, the Yankees and Canadiens went from legend to legend back in the day. It happens, but changes to sports (more teams, salary caps, better scouting) have made it very hard to replace one legend with another. For San Jose, the odds of replacing Thornton with something comparable aren’t zero. Just close to it. A year from now, Thornton will likely be top-20 in all-time points. He’ll pass players like Brett Hull, Brendan Shanahan, Guy LaFleur and Jari Kurri on the way. With good health and a bit of luck , he could finish top-10 all-time in points and top-5 all-time in assists. At age 36, Thornton has more career points than Selanne did at the same age, and more career assists than Jagr at the same age. Legends are legends for a reason. They are the best of the best. This is the company Joe Thornton is keeping. This season, he is playing as well as anyone in the game. He is keeping the window open for the San Jose Sharks. The Sharks window will stay open as long as Joe Thornton keeps it open. If you follow the Sharks media, you’ll notice the enthusiasm for Sharks to win postseason honors. Peter DeBoer belongs in the Jack Adams conversation as top coach. Joe Thornton belongs in the conversation for the Hart as MVP (look for my comments on Thornton in the upcoming version of Facing Off). Brent Burns belongs in the discussion for the Norris as best defenseman. I understand the case for each. Yet its tough to argue that you have the best player, the best defenseman and the best coach when the team finished with 98 points. Last season, all four wild card teams had at least 98 points. How does a team with the point total typical of a fringe contender have people in contention for all these major awards? Brenden Dillon spent almost the entire season without giving up a goal on the penalty kill. He led the league in PK ice time without giving up a goal (over 65 minutes). His streak was snapped in game 81 against Winnipeg. Later in the game, Dillon was on the PK for a second Winnipeg goal. Winnipeg finished last in the NHL in power play goals. Dillon finished the season positive on the PK (plus-1), one of just seven players to do so. Teammate Dainius Zubrus (also plus-1) was one of the others. Speaking of Zubrus, he was the person who took over the NHL lead in penalty kill ice time without giving up goal after Dillon’s streak ended. Not bad for a player who wasn’t on an NHL roster to start the year. The Sharks committed four penalties in the season finale against Arizona and Zubrus spent 2:20 on the ice short-handed. He finished the season with a league-best 49 minutes of short-handed ice time with no goals scored against. San Jose finished the season tops in power play goals with 62 and net power play goals with 55. The net power play scoring was very close. The Blackhawks finished third in power play goals, five goals back of San Jose. However the Sharks gave up four more short-handed goals than Chicago. The Stars finished second in power play goals, but tied for tenth in net, having given up a league-high 15 shorties.